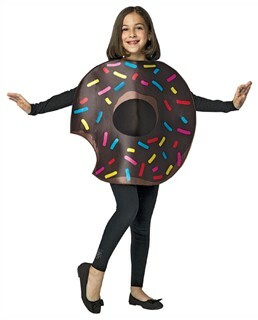 The Kids Chocolate Donut Costume, will make your little one look absolutely scrumptious! Take a bite out of this donut suit. It features a chocolate frosting rainbow sprinkle design, so you'll just want to eat your child up when they put it on! If your child is not one to eat their veggies, but love donuts, then this is the perfect costume for them! Why simply trick or treat for your favorite treats when you can become one in this kids donut costume? Make this Halloween extra sweet! Product includes one kids donut suit. Availability: The Kids Chocolate Donut Suit ships in approximately 1 business day.